Time travel! Who hasn't dreamed of being able to travel into the future or the past HG Wells Time Machine, Back to the Future and many others have intrigued us with ideas of time travel? Pinhole is all about the possibility of time travel and all the possibilities and effects that could arise from being able to see into the future or the past or even being able to possibly actually transport ourselves back in time or into the future. Edmond Blakely builds a machine capable of looking into the future but it only offers a very small aperture not big enough to do much with. Cassandra knows the future brings her doom but is helpless to stop it. Lionel executes murders before they can kill but wonders who the real victims are. Dolores is ensnared in a cult that uses a machine to link their minds and bodies. 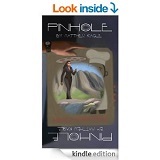 Joseph strives to escape an eight year loop he's been trapped in his whole life. Daphne searches for a murderer who kills by giving his victims cancer. But she may be the next target. What could happen if mankind were able to achieve it? I enjoyed this story and in my opinion this is a very well written book full of intrigue and suspense. Not only does it give you a glimpse into what time travel would be like it also shows highly recommend it.